Thanks for your continued support of the Michigan Turfgrass Foundation. The mission of the Michigan Turfgrass Foundation is to support the research, teaching, and extension programs at Michigan State University. If you are not a member and are interested in joining the MTF please Join Us. Another avenue to support the MTF and MSU Turf Team is to participate in bidding or spreading the word of our current TeeTimes4Turf auction, currently over 117 golf courses are available via an on-line auction at www.teetimes4turf.com. The auction ends on Sunday, May 14 at 7 p.m. In the last week, dandelions have been lighting up the landscape with their brilliant yellow flowers. In most areas, the first flush of dandelion flowers has come and gone and now the puff ball stage is in full effect. According to Michigan State University Extension, applying a herbicide at the puff-ball stage can be very effective as this is the time the dandelion is at its weakest because it has just spent all that energy pushing out flowers. Applications prior to puff-ball stage can be effective at burning down the rosette and preventing puff-balls but keep in mind if you really want to get ‘em, schedule a fall application. In addition to dandelions, many other broadleaf weeds are flowering in turf right now. Common chickweed, henbit, shepherd’s purse, yellow rocket, corn speedwell, wild violet and ground ivy are all flowering. All but wild violet and ground ivy are winter annuals. The life cycle of a winter annual is they germinate in the fall, overwinter, and then flower and produce seed in the spring. After flowering in the spring, winter annuals are usually only two to three weeks from dying. If you apply herbicides now, they will be dead and gone in two to three weeks and if you do nothing, they will be dead and gone in two to three weeks. Get it? Similar to the strategy of controlling dandelions, there are some very tough to control weeds that are also flowering right now. Ground ivy (AKA Creeping Charlie), wild violet, and several speedwells (Germander and Creeping) are actively flowering. The flowering period is the best opportunity to kill them until fall arrives. The typical broadleaf combination herbicide containing 2,4-D provides fair control at flowering but if you can find combination herbicides with the active ingredients quinclorac, triclopyr, fluroxypyr, or carfentrazone you should achieve better than fair control. Dr. Frank’s work is funded in part by MSU’s AgBioResearch. The mission of the Michigan Turfgrass Foundation is to support the research, teaching, and extension programs at Michigan State University. Join Us to become a member. In the last week, heavy rains blanketed most of Michigan, resulting in streams and rivers overflowing their banks and flooding in many low-lying areas. The water has slowly started to subside and turf that was flooded may be exhibiting damage symptoms. Factors that determine turf survival under water include turfgrass species, submergence duration, submergence depth, water temperature and light intensity. Turfgrass species differ in their ability to survive flooding. Unfortunately, there are no hard fast numbers such as Kentucky bluegrass will survive five days and creeping bentgrass 15 days under water. Instead, species have been assigned relative submersion tolerance ratings: creeping bentgrass–excellent; Kentucky bluegrass–medium; Poa annua and perennial ryegrass–fair. As submergence depth increases, the potential for injury increases. If the leaf tissue is above the water line–even just a little bit–the turf will probably survive. On golf courses, many have observed creeping bentgrass floating on the edge and even growing out into a lake. This is a perfect example of turf surviving when partially submerged. The final two factors affecting turf survival are water temperature and light intensity. Both of these factors are working in our favor right now as the air and water temperatures have been cool. Flooding during the summer months when temperatures are higher often result in damage to the turf when it’s submerged for even a short time. As the water recedes, the turf may be yellow or brown. The discoloration is related to the turf losing its ability to take up nutrients. It doesn’t take long once turf is submerged for soil oxygen levels to decline and root hairs to begin to die. As the root system becomes impaired, nutrient extraction and water uptake will be limited. Keep this in mind once the water has receded as the turf may benefit from a light fertilizer application. To assess if submersion has caused injury, Michigan State University Extension advises extracting several plants from the flooded site and cutting a horizontal cross section through the crown. If the crown is white and firm, it has survived. If the crown is brown and mushy, it’s dead, so time to develop a reestablishment plan. Finally, for those areas that were flooded due to a stream or river overflowing a bank, you are probably dealing with silt or soil deposition. Removal of soil deposition can be difficult and seeding into the deposited soil can be an option. Once you’ve successfully reestablished soil, cultivation such as core aeration or slicing will benefit the turf by breaking through deposited soil layers to facilitate rooting and water infiltration. Timing crabgrass pre-emergence applications When is the correct time to apply crabgrass pre-emergence herbicides? Spring 2017 has been a roller coaster ride of temperature peaks and valleys. What started as an early spring with warm temperatures melting snow and many golf courses locally opening the third weekend of February has since stalled. There have been many questions from those tracking growing degree-days (GDD) at GDDTracker this year as to whether or not the models are accurate. GDDTracker starts counting GDDs on Feb. 15. 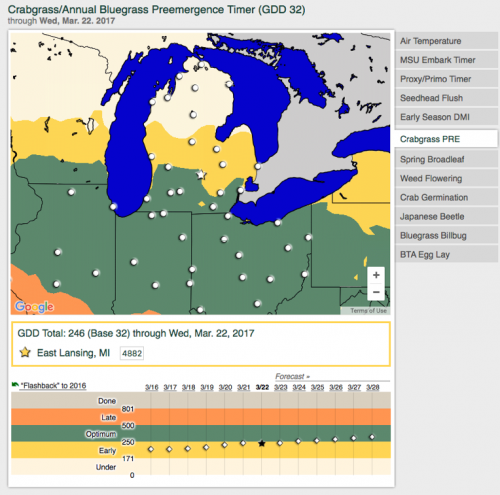 The crabgrass pre-emergence model uses GDD (base 32 degrees Fahrenheit) to indirectly measure soil temperatures in a turf situation (enter your zip code under the map and then click on “Crabgrass PR”). The GDD model attempts to predict the optimum application timing for when the 0-2 inch depth soil temperatures consistently reach 50-55 F. Applications made at this time provide adequate time for the pre-emergence herbicide to be applied and watered in before crabgrass germination occurs. Summer annual grasses such as crabgrass require proper soil temperature and moisture to germinate and establish. Eighty percent of germination will occur when soil temperatures at the 0-2 inch depth are consistently between 60-70 F. For pre-emergence herbicides to be effective, they need to be applied before the soils reach this optimum temperature range. At the Hancock Turfgrass Research Center on Michigan State University’s campus, we have yet to record a soil temperature of 50 F at a 2-inch depth. The warmest soil temperature recorded this spring was actually 45 F on March 1, and currently soil temperatures are hovering around 36-37 F, well below the range of 50-55 F we’re targeting. Currently, the GDDTracker model has most of the state south of a line from Grand Rapids-Lansing-Detroit in the optimum application window. I think it’s important to remember that these models are meant to serve as “guides” and not absolutes. At least so far it appears the models are ahead of soil temperatures, but also keep in mind the range the optimum application window extends from 250-500 GDD. You don’t have to apply the first day the model indicates optimum. My best guess, and it’s nothing more than a guess based on the 10-14 day weather forecast, is that the application window GDDTracker is predicting will last into the first couple of weeks of April at a minimum. In addition to using soil temperatures and GDDTracker, a good environmental indicator for pre-emergence timing is when forsythia bushes are blooming with their bright yellow flowers. Every year I watch a forsythia bush near my office—it happens to be located on the south side of a building so it’s a warm site and usually blooms a little early. I haven’t seen any color from blooms yet. Although GDDTracker tells me it’s go-time, the other indicators of soil temperature and forsythia blooming don’t. For now, I’d hold off on making crabgrass pre-emergence applications. When it’s all said and done, I’m guessing the typical target date of around April 15 in mid-Michigan will be about right this year. It’s interesting to note that through March 22, 2017, GDDs (246 GDD) are actually behind 2016 (254 GDD). If you have already applied a pre-emergence application or are still planning on making applications in the next week, the applications will still be effective but you’ll just want to be on the lookout for any late spring/summer crabgrass germination escapes that would require post-emergence control. Another strategy for dealing with an early application would be to follow-up with a “booster shot” second pre-emergence application at half the label rate in approximately 30-45 days after the first application. Remember, the practices that encourage a healthy, dense turf stand, such as mowing high, returning clippings and adequate fertilization, are all part of an effective crabgrass prevention strategy. 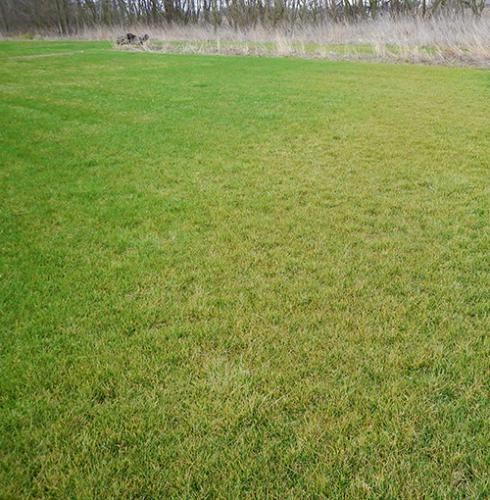 Controlling annual bluegrass seedheads: Spray now or wait? 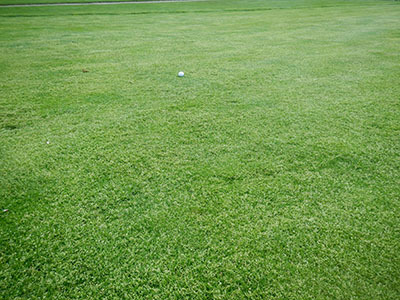 Growing degree-days have accumulated quickly, but it may not yet be time to apply plant growth regulators to control annual bluegrass seedheads on golf courses. The quick start to the growing season in 2017 has resulted in many questions regarding growing degree-days (GDD) and application timing for Proxy/Primo to control annual bluegrass seedheads. The green wave of GDD reaching the application timing has swept into Michigan (see figure). Many golf course superintendents use two applications of Proxy/Primo for managing annual bluegrass seedheads on putting greens. This combination has proven to be a reliable way to suppress seedheads and enhance turf quality in the spring. GDDTracker starts measuring GDD on Feb. 15 and uses anything over 220 GDD (base temperature of 32 degrees Fahrenheit) as a guide to making the first application. However, Michigan State University Extension advises considering some factors. Both products are foliar absorbed and need living, green plant tissue for uptake. Applying Proxy/Primo to dormant turf will not be effective. GDD total greater than 220 (base 32 F). Turf is 100 percent green. There is no benefit from applying your Proxy/Primo to dormant turf. However, if you have green-up, mowed and already made an application, the cold temperatures should extend control. Air temperatures drive the metabolism of Proxy. Part of the reason the application range is so generous is that in cold weather it takes longer to get active in the plant, and in warmer weather it gets active faster. The activity of Proxy/Primo will either be “extended” by cold weather or “activated” by warm weather. Typically, the second application is made 14-21 days after the initial application. Temperatures are forecast to be cold for the next week, so the second application could be delayed a week or more, as the product will remain in the plant longer in cold weather. Annual bluegrass seeding in a fairway. Photo: Kevin Frank, MSU. The low-temperature growth chamber that was purchased earlier this year by a partnership between the Michigan Turfgrass Foundation’s Founders Society, MSU AgBio Research, and the MSU Growth Chamber Facility has arrived at MSU. The chamber will be used by MSU turf researchers to investigate winterkill of Poa annuaputting greens. Initial research projects have been funded by the USGA, MSU Project GREEEN and Syngenta and began earlier this summer at the Hancock Turfgrass Research Center. Research is focusing on the effects of plant growth regulators and plant health treatments on turfgrass survival under ice. Turfgrass cores from the field plots have been extracted and are in the process of being acclimated for ice treatment in the low-temperature chamber. The objectives of these research projects are to determine treatments that can ultimately be used by golf course superintendents to minimize the risk of winterkill on putting greens. 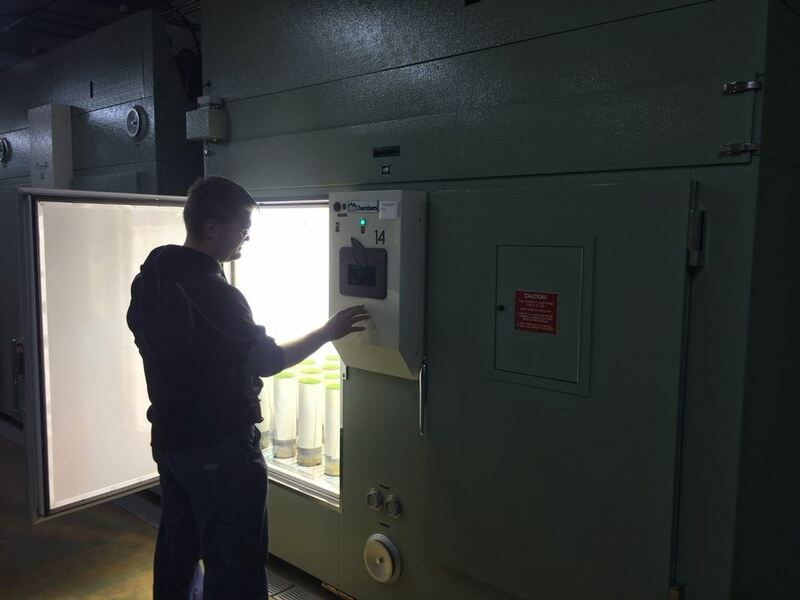 Thanks to the MTF Founders Society, MSU AgBio Research, and the MSU Growth Chamber Facility for purchasing the low-temperature chamber to facilitate our winterkill research efforts. Graduate student Kevin Laskowski adjusting the temperature of the low-temperature chamber. Some might remember 'What Lies Beneath' as the title of a horror movie but currently ice is a real life potential horror for golf course superintendents worried about winterkill. The winter of 2013-2014 will be remembered for many years to come. The first significant event was the ice storm of Dec. 21-22 that knocked out power for thousands and coated everything, included exposed turf, with a perfect coating of ice. Tall fescue encased in ice. Most turf areas were covered with snow prior to the icing event and as the rain percolated through the snow it formed a very porous, crusty ice-snow layer. This type of ice-snow layer is not a concern for turfgrass as it is porous and allows for gas exchange from the turf/soil interface to the atmosphere. Two inch porous snow-ice layer + 1 in. snow on top. Five days after the ice storm (Dec. 27) temperatures at the Hancock Turfgrass Research Center (HTRC) warmed to 38 °F and were accompanied by 0.15 in. of rain. On Dec. 28 and 29 temperatures were above 40 °F. The warm temperatures resulted in melting and I believe this is when the first ice layer formed. On Dec. 30 temperatures dropped and we all learned what a Polar Vortex meant as day time high temperatures were in the single digits and nighttime lows were well below 0°F. The Vortex combined with a foot or more of snow closed MSU for Jan. 6 and 7 but by Friday Jan. 10 the HTRC recorded a daytime high temperature of 38 °F and by Jan. 13 the high temperature was 44 °F. This resulted in another melting event and another ice forming event as temperatures in the day melted snow and nighttime temperatures refroze any remaining water. Some superintendents that were clearing snow from putting greens throughout the winter may have been successful at removing any ice that existed or formed during these melts. However, depending on available labor and equipment many superintendents are not able to constantly remove snow during the winter so ice formation is inevitable. Since the melting ended on Jan. 13-14 the temperatures have been well below the point where any further melting would occur. Not every green at the HTRC is covered in ice but at least one poorly draining Poa annua putting green is now covered in a 1-2 inch ice sheet. I believe this ice sheet initially formed during the Dec. 28-29 melt so as of today (Jan. 29) the Poa has been under ice for 31 days. Two inch ice sheet on Poa annua green at HTRC. In Michigan especially for Poa annua greens, crown hydration and subsequent refreezing are often the primary culprits of winterkill. However, this year ice sheets are a cause for concern. In the 1960’s James B Beard conducted research at MSU on survival of creeping bentgrass and Poa annua under ice sheets. Creeping bentgrass survived 120 days of ice cover without significant injury while annual bluegrass was killed somewhere between 75 and 90 days of ice cover. More recently Darrell Tompkins conducted research at the Prairie Turfgrass Research Center in Canada that suggested Poa annua greens could be damaged in as few as 45 days under ice. The primary cause of death to turfgrass under ice sheets is most likely from toxic gas accumulation under the ice sheet from soil and turfgrass respiration. The day estimates for turf survival are just that, estimates, use them as a guide but know that they are not absolutes. Whether or not to attempt ice removal is a difficult decision for golf course superintendents. The decision to remove ice can be based on several factors including: turf sampling, duration of ice cover, current and future temperatures, ability to remove water following melting from the green, and labor. 1. Sampling – Bob Vavrek from the USGA recently posted a great YouTube video http://tinyurl.com/k9mbfjc on how to sample greens under ice to assess survival. An important point that Bob makes is that there is variability in sampling and just because your sample comes out alive doesn’t mean all areas on the green will survive – same can be said if your sample is dead. 2. Duration of ice cover – as discussed in the previous section, estimates of days of ice cover causing death vary from 45-90 for Poa annua and 120 days for creeping bentgrass. At this point I’m less concerned for creeping bentgrass surfaces as I’d expect significant melting before we reach a 120 day threshold as this would be well into April. Poa annua is less certain as at the HTRC we will approach 45 days under ice cover by mid-February. Check your calendar and start counting. Ice sheet at HTRC, 31 days and counting. 3. Temperatures – our 10 day forecast does not look good for trying to remove ice as day time high temperatures are forecast in the teens to low 20's with nighttime lows in the single digits. Part of the concern with removing ice is exposing the turf to cold air temperatures after being insulated with snow and ice since mid-December. In the past, some superintendents have removed ice and then recovered the greens with snow to provide insulation against cold temperatures. 4. Physical ice removal – physical ice removal includes practices to fracture the ice with impact (hammers, chisels, aerifiers, slicers) and then remove the fractured ice sheet with shovels, tractors, or skid steers. I recommend avoiding direct impact with tools such as hammers to less impact concentrated equipment such as slicers and aerifiers. There’s always some risk associated with impact related ice removal but the alternative of leaving ice in place and rolling the dice on survival is also risky. Damage from a hammer used to crack ice. 5. Melting ice – there are many different products that have been used to melt ice including black sand, dark colored natural organic fertilizers, and synthetic fertilizers. The key to any melting strategy is to be able to remove the water from the green following melting so it doesn’t refreeze and form another ice sheet. We will be testing products to melt ice at the HTRC in cooperation with researchers from the Univ. of Minnesota in the coming weeks. 6. Labor – if you’re going to remove ice you need help. Ice removal is not a 1-person job. If your golf course has 18 greens covered in ice even with several employees this is not a one day job. Unfortunately there are no guarantees with respect to winterkill and whether or not ice is removed. The days under ice cover for survival are estimates from research and conditions from course to course and even within the same course vary thereby effecting how long turf can survive under ice. It’s already been a long hard winter and let’s all hope our turf survives so it’s not a long hard spring reestablishing grass. The Michigan Turfgrass Foundation exists to promote safe, healthy turf surfaces for all Michigan residents.